Britain’s biggest motorcycle manufacturer has awarded Danny Rose, a trainee technician at Fowlers Motorcycles in Bristol, the accolade of Triumph UK’s Dealer Apprentice of the Year. He was presented with the trophy at Triumph’s annual Season Launch Conference and Awards Dinner at the Athena in Leicester, close to the company’s Hinckley factories. Triumph’s Advanced Apprenticeship Programme is an industry-leading training scheme that helps trainees to fulfil their ambitions within official Triumph dealerships. Apprentices work towards a nationally recognised qualification that aims to equip them with the skills to provide customers with world-class technical expertise. Founded in central Bristol in 1926, Fowlers can trace its apprenticeship training back over 60 years, working with local colleges and manufacturers’ schemes, too. Danny adds; “I’ve thoroughly enjoyed being at Fowlers and working my way through Triumph’s apprenticeship programme. Everyone has been extremely helpful every step of the way, whether it be the people I work with on a day to day basis or my tutor, Richard, at Triumph. The facilities and training available to apprentices in the programme are second to none. It’s always a pleasure to go to Hinckley and train with Triumph”. This entry was posted in Awards, Triumph on 18/02/2018 by Dan Sager. 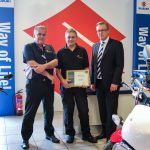 Dave Ball – Master Motorcycle Technician at Fowlers of Bristol – has claimed the runner-up crown at the 2017 Suzuki European Motorcycle Skills Competition, held in Germany on the 20th September. Dave, who was chosen to represent Britain after winning the UK Championships earlier this year, beat off tough competition to scoop second place. He pitted his considerable skills against strong opposition from Suzuki winners representing other European countries, working his way through three gruelling practical tasks and an hour-long written examination. 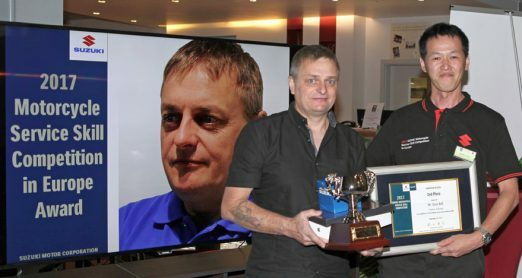 Dave Ball has been with Fowlers for 20 years and his talent has been recognised in several other competitions: he won the Yamaha UK Tech Grand Prix last year, the Suzuki UK Motorcycle Technician of the Year in 2013 and the Yamaha UK Technician of the Year award in 2007. Fowlers is conveniently located at 2-12 Bath Road, Bristol BS4 3DR, on Bristol’s A38 inner ring road and within a 5-minute walk of Temple Meads mainline railway station. This entry was posted in Awards on 17/10/2017 by Dan Sager. 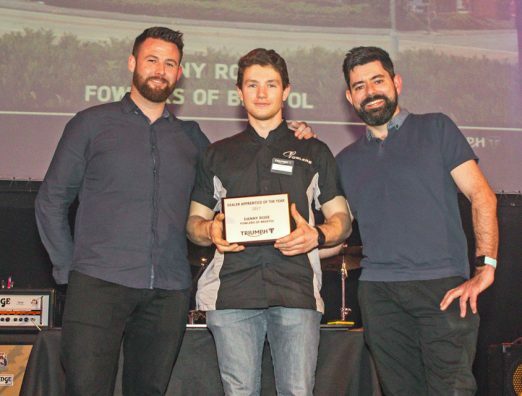 Master Motorcycle Technician Dave Ball, one of Fowlers of Bristol’s many highly skilled technicians, is set to go head-to-head with other top-class mechanics from across Europe at Suzuki’s European Service Skill Competition. Dave has been chosen to represent Britain after winning the UK championship this summer, and will travel to Germany in September for the international round. 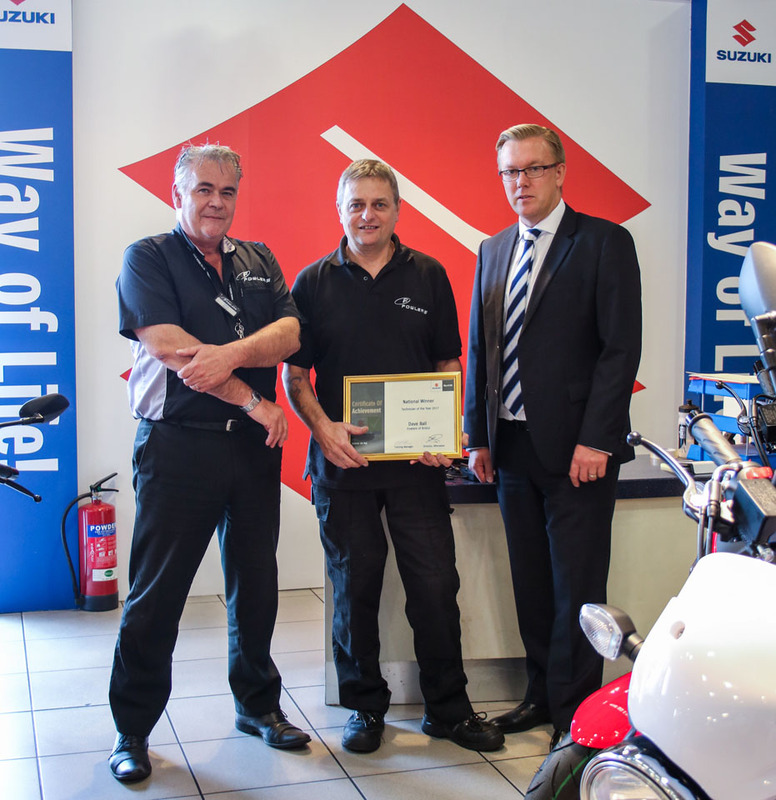 To make the grade, Dave pitted his considerable mechanical skills against three other top technicians at Suzuki GB’s headquarters in Milton Keynes, in a series of practical challenges which tested his expertise in areas including fault-finding and diagnostics. This entry was posted in Awards on 08/08/2017 by Dan Sager. 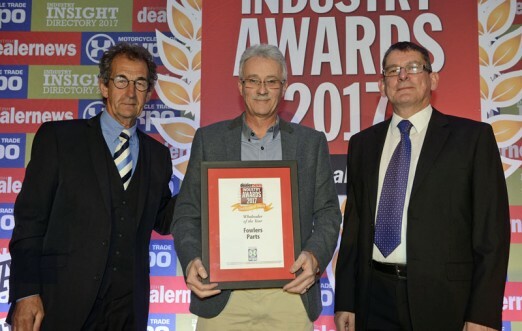 Fowlers Parts has won a national award for the third successive year. Awards are given based on the highest number of votes by readers of British Dealer News, which is distributed 8,661 people working in the UK motorcycle industry. At a ceremony attended by 300 motorcycle industry personnel, Fowlers Parts & Contact Centre Manager, Pete Aitkenhead, who joined the company in the 1970s, collected the award from ex-racer and TV commentator Steve Parrish. It is the fourth time that Fowlers has won a hotly-contested BDN award, having previously collected trophies in 2016, 2015 and 2013. “We are immensely grateful that our loyal trade customers have taken time to vote for Fowlers yet again”, says Joint Managing Director, Stephanie Fowler. “Fowlers Motorcycles celebrated its 90th anniversary in 2016 and the business continues to grow, thanks to ongoing investment in new technology and taking care of our dedicated staff in the warehouse, call centre and out on the road. With 3 million line items available and over 100,000 physical stock items, a skilled team with knowledgeable and experienced leadership is every bit as important in giving our customers a great all-round service as picking machines and computerised ordering systems”. Customers have access to Fowlers’ Electronic Parts Catalogue system [EPC] 24 hours a day, 7 days a week, where they can search for genuine parts from Yamaha, Vespa, Triumph, Suzuki, Piaggio, Moto Guzzi, KTM, Kawasaki, Honda, Gilera, Derbi and Aprilia, check availability and even view images & diagrams. Inside the new warehouse facility, opened in 2015, are five automated carousel sorting machines, each capable of storing 25,000 lines, as well as four lean lifts, which house the bulkier items such as bodywork, frames and wheels. In addition to this vast range of parts, Fowlers also supplies a comprehensive portfolio of motorcycle clothing, accessories and helmets to motorcycle dealers across the UK under the banner of The Key Collection. You can find out more by calling Fowlers on 0117 977 0466 or visit www.fowlersparts.co.uk. This entry was posted in Awards on 26/01/2017 by Dan Sager. Yamaha wins three titles at the 2016 MCN Awards! Three of the best from Yamaha! 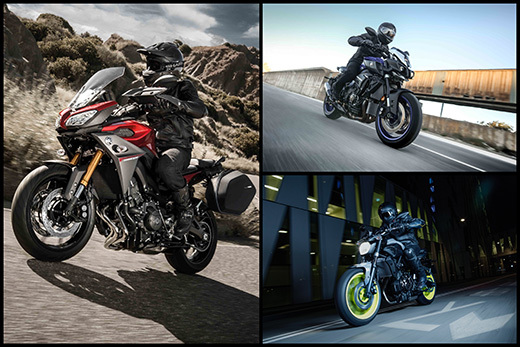 Once again Yamaha has scooped up awards in three classes in the prestigious annual MCN awards announced today. The MT-10, new this May, has been massively popular and was announced the winner of the MCN Naked Unlimited class for 2016. The MT-07, a middleweight all-round naked machine that has proved popular and versatile this year, has also won the title for MCN Naked Middleweight. Having been voted MCN Bike of the Year in 2014 following its launch, we wonder what 2017 has in store for this bike. Finally, the All-Rounder title has been scooped by the Tracer 900 for the second year running. Keen on one of these winners for yourself? Give our sales team a call on 0117 977 0466 or email sales@fowlers.co.uk. This entry was posted in Awards, Yamaha and tagged Awards, MCN, MT-07, MT-10, Tracer 900, Yamaha on 19/10/2016 by Fowlers News. Fowlers wins MCN South West Dealer of the Year! For the second year running, Fowlers Motorcycles has been named ‘Best Multi-Franchise Dealer in South West England’ by Motor Cycle News. Picked out by the judges as one of “the UK’s eight best bike dealers”, Fowlers is Bristol’s longest-established motorcycle retailer; founded in 1926 by Alice and Frank Fowler, the business is still owned and run by the same family. 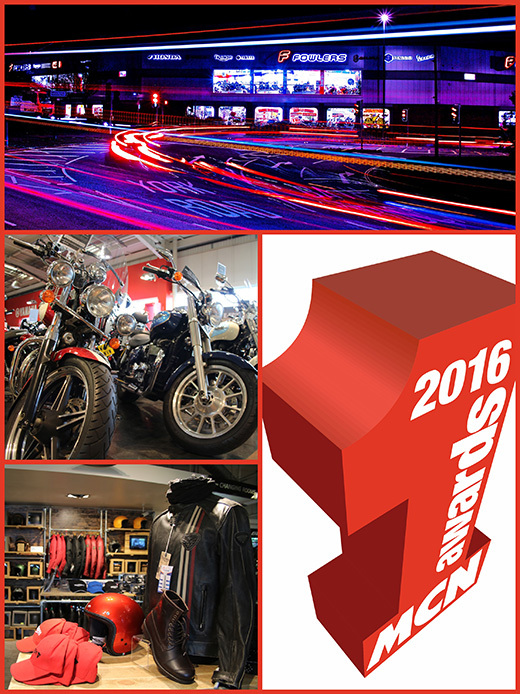 The dealership is conveniently located close to Temple Meads mainline railway station on the A38 inner ring road and is one of the most spectacular showroom spaces in Europe for motorcycles, clothing, accessories and spare parts. Customers are offered an unrivalled line-up of new motorcycles and scooters from Aprilia, Gilera, Honda, KTM, Moto Guzzi, Piaggio, Suzuki, Triumph, Vespa and Yamaha, with an off-road centre and hundreds of pre-owned machines. There’s even a free-to-join loyalty card rewards scheme. Supported by more than a dozen skilled, factory-trained technicians in the Service Department, which benefits from almost instant access to genuine parts and accessories supplied by Fowlers’ award-winning spares wholesaling operation, a full after-sales service is taken care of. Recent changes include a complete re-design of the 7,500 square feet clothing and accessories department, which gives customers an unparalleled choice of products, together with a re-fit of the famous Harry’s Café, providing a relaxing environment for people to enjoy a drink or some freshly prepared food. There’s also the recent addition of a fantastic new mezzanine level, which houses the dedicated off-road department. You can find out more by calling Fowlers on 0117 977 0466 or visiting www.fowlers.co.uk. This entry was posted in Awards and tagged Awards, Fowlers, MCN on 19/10/2016 by Fowlers News.